Beartooth began as an emotional exorcism. Conceived, constructed, and unleashed by one man in a basement studio. Now, even as the band has grown to become a headlining festival act; cracked Billboard’s Top 25; lit up SiriusXM radio; and were crowned Breakthrough Band at both the Metal Hammer Golden Gods Awards and Loudwire Music Awards, Beartooth’s music and message remain intensely personal. The fierce dedication to honesty, authenticity, and raw fury demonstrated by Caleb Shomo is at the center of everything Beartooth represents. The music he’s crafted in his darkest hours transcends, connecting with the broken hearted and isolated around the globe. Songs like “In Between,” “Hated,” “The Lines,” and “Sick of Me” have been streamed hundreds of millions of times. These are anthems for the downtrodden and disconnected, celebrated with sing-alongs on international tours; supporting Slipknot, Bring Me The Horizon, or Pierce The Veil; on the Kerrang! Tour with Don Broco in the UK; at major festivals like Download and Rock on the Range. What began as artistic self-medication for a single multi-instrumentalist and producer, with no career aspirations or grand plans, quickly caught fire. The Sick EP (2013), Disgusting (2014), and the sophomore-slump shattering Aggressive (2016) comprise a blunt audio journal, chronicling Shomo’s battles with his own demons. As Beartooth became a fully functioning band, bringing these intimate musings to the masses, that purity remained, via a consistently isolated creative methodology. The stark look inward further intensified with September 28, 2018’s Disease. The third full-length album from Beartooth is a painstaking, riff-driven examination of the unshakeable throes of depression. While there are moments of positivity, this isn’t the sound of triumph. This is music about survival. “The album is a whirlwind of emotion,” Shomo explains. “Crazy highs, crazy lows, and lots of intensity. This record isn’t about winning anything. It’s about trying to even begin to learn how to deal with things. It’s hard to process just how dark you can get, what you can really put yourself through with expectations. It’s like starting from the beginning all over again. At the end of the day, it is a very dark album.” Even as Shomo and his bandmates played to sold-out crowds across Europe, the battle against mental illness and childhood issues returned, and the seed for Disease was planted. The title track was the first song written for it, setting the overall tone. As always, Shomo recorded vocals, guitars, bass, and drums, and mixed the album himself with assistance from an engineer, now with executive producer (and Grammy winner) Nick Raskulinecz, who has worked with Foo Fighters and Rush. To further enhance the emotional realism Beartooth champions, the third full-length album was tracked in a brand new environment, with an old-school urgency. After crafting the songs in his usual basement domain, Shomo made the trip from the familiar comfort of his equipment and isolation in Ohio to Blackbird in Nashville. “When I make a record at home, I feel really safe there,” Shomo confesses. “Going into Blackbird, there was a lot of fear. Thankfully, going into that environment just brought out the best. It made the songs feel even more real. It was all worth it.” The famous recording studio was the birthplace of pivotal work from a massive list of legends, tastemakers, and up-and-comers; like Alice In Chains, Taylor Swift, and Greta Van Fleet. Determined to challenge himself in new ways, Shomo kicked aside his drum samples and digital guitar tones in favor of rich analog vibes, banging out take after take, to capture the feel of classic favorites like AC/DC and Motörhead. Ten to twelve hour days, six days per week, sweating and screaming through performances, resulted in gargantuan surefire Beartooth bangers like “Used and Abused,” “Manipulation,” and “Enemy,” easily among the strongest songs in the catalog. “You Never Know” was written in collaboration with producer and songwriter Drew Fulk (Fit For A King, As I Lay Dying), after several hours of conversation in a coffee shop. The album closer, “Clever,” was written in an afternoon at the studio, a fittingly sorrowful bookend to Beartooth’s darkest album. “Depression is something that’s just ‘in your head,’ there’s no reason for it, so it ‘should’ be easy enough to just get over, but I can never do it. It’s something unshakeable. I can’t make it work,” Shomo says. “I wanted to write an album about that. Disease really encompasses everything emotionally that I wanted to convey.” Shomo’s commitment to raw and personal truth will always define Beartooth. “It’s very important that I stay honest with every song that I write. I didn’t even mean to start this band. I wrote a couple songs and I felt way better afterward. Especially with this record, there are no compromises. 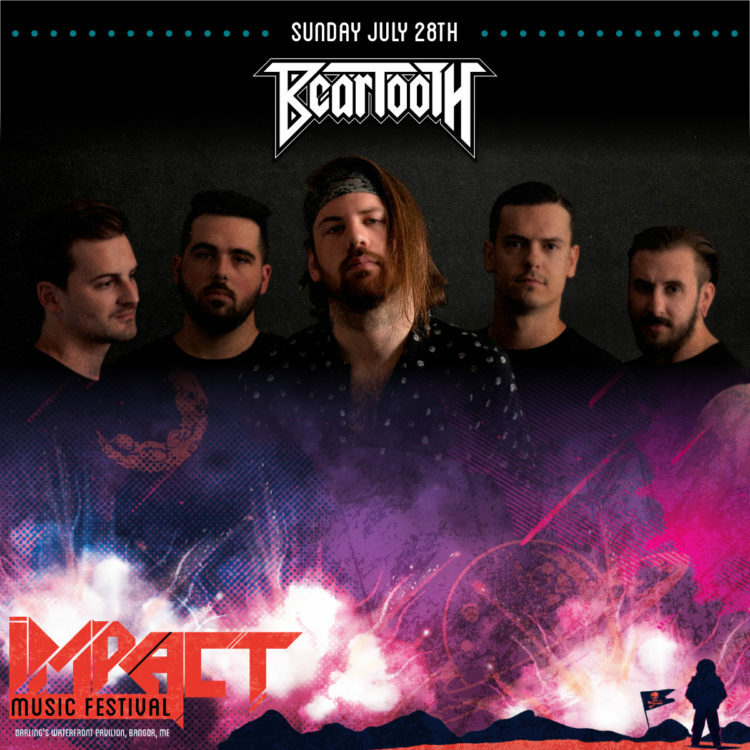 It is exactly what I wanted to make.” With Beartooth, what begins each time as the personal expression of one man is shared with his bandmates, then through the power of musical inspiration and connection, is given to the world then returns to its creator, to begin the cycle anew.